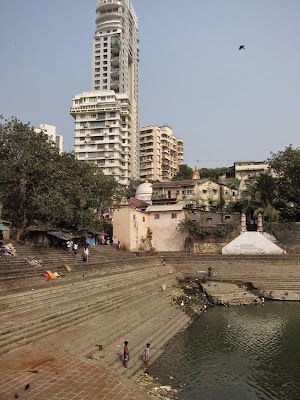 A smattering of rarely-touristed temples in South Bombay. Granted, Bombay is not a temple town. 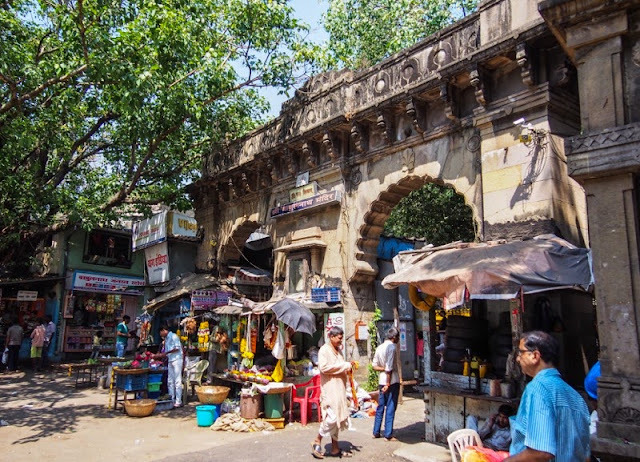 It's no match for Varanasi or the temple towns of Tamil Nadu. But given that Bombay's attractions are mostly colonial in nature (as if those Britishers hadn't been kicked out 65 years ago) it's refreshing to see a different side of the Maximum City, one where spirituality takes precedence over commerce, and where peace and quiet (almost) trumps traffic noise. 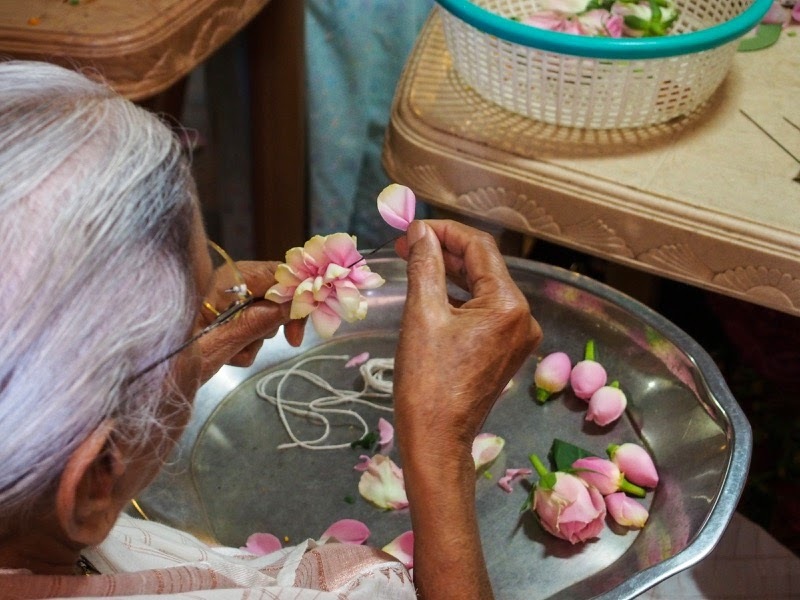 In this handy package you'll come face to face with some of India's fascinating diversity: from Lingam-worshipping Shaivites to strictly vegan Jains to singing Hare Krishnas. The following four temples are all on the Malabar Hill peninsula, which contains Bombay's most expensive bits of real estate (on par with Paris or London.) 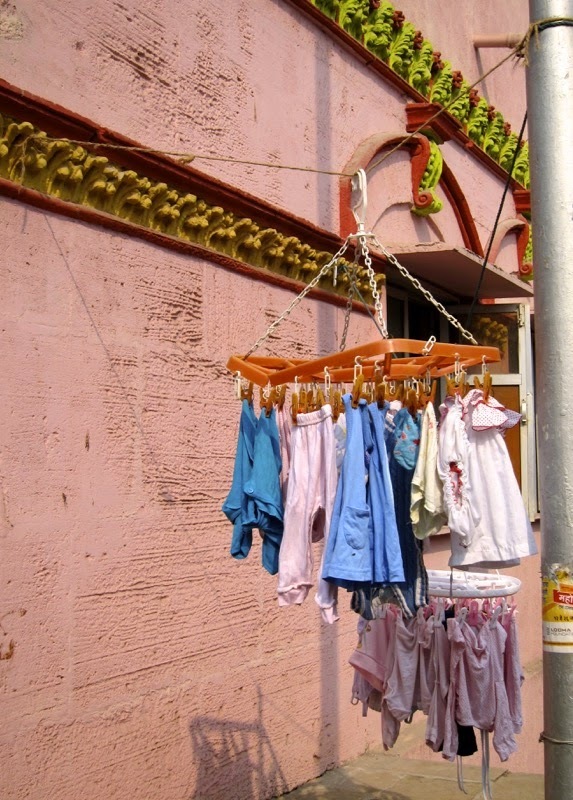 They can easily be strung together for a few hours of Minor Sightseeing. Map. This is not just a temple- this is a mini Varanasi. 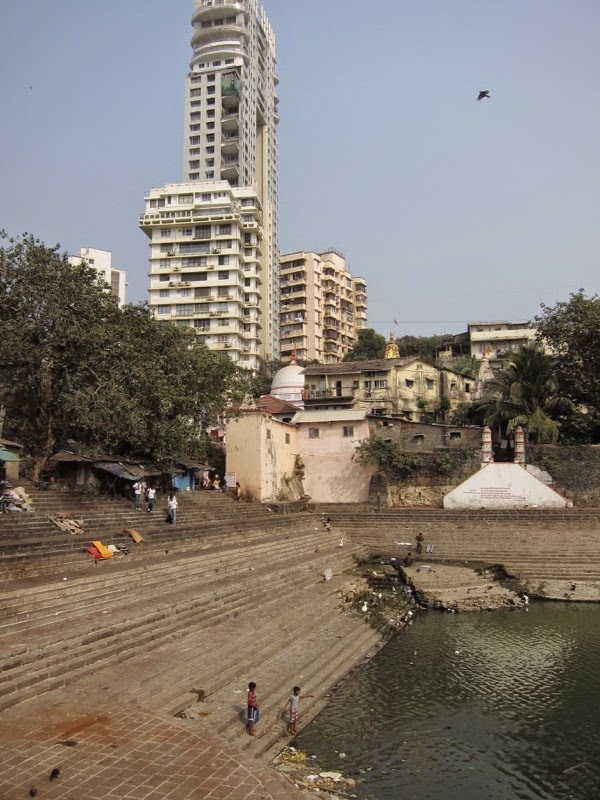 One of Bombay's oldest settlements, it is centered on the Banganga Tank, a rectangular body of water surrounded by ghats (steps) on all sides, providing a faint resemblance to the famous ghats of Varanasi. A mini-Varanasi with maximum-real estate. But the Varanasi connection goes deeper: Lord Rama is supposed to have stopped here on his backpacking trip to Sri Lanka, and, being rather thirsty, he (or his brother, depending on who you ask) shot an arrow into the ground and lo! a wormhole to the Ganges brought holy water right to the tip of this peninsula. Hence the name: Bana ('arrow' in Sanskrit) Ganga. The whole area is fascinating to wander around: the main temple is the Walkeshwar temple but there are another twenty or so smaller shrines. It certainly feels like you've been teleported from metropolitan Bombay to a holy rural village. If you're here in January, try to attend the annual festival. 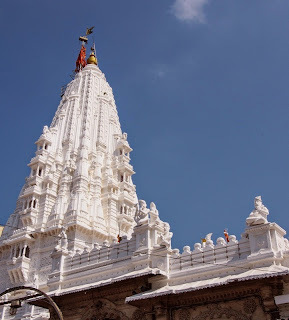 Arrow-shooting distance from Banganga you will find a Jain temple that goes by multiple names- the full name on the building is Babu Amichand Panalal Adishwarji Jain Temple, located on a road sometimes known as Ridge Rd, sometimes as BG Kher Rd. 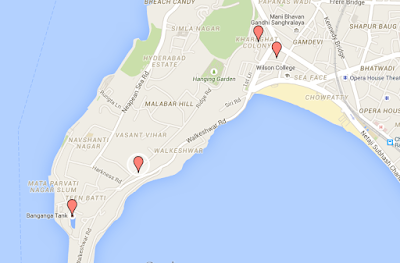 (In typical Bombay fashion, addresses are useless: you need a landmark. In this case, the police station, right next door). 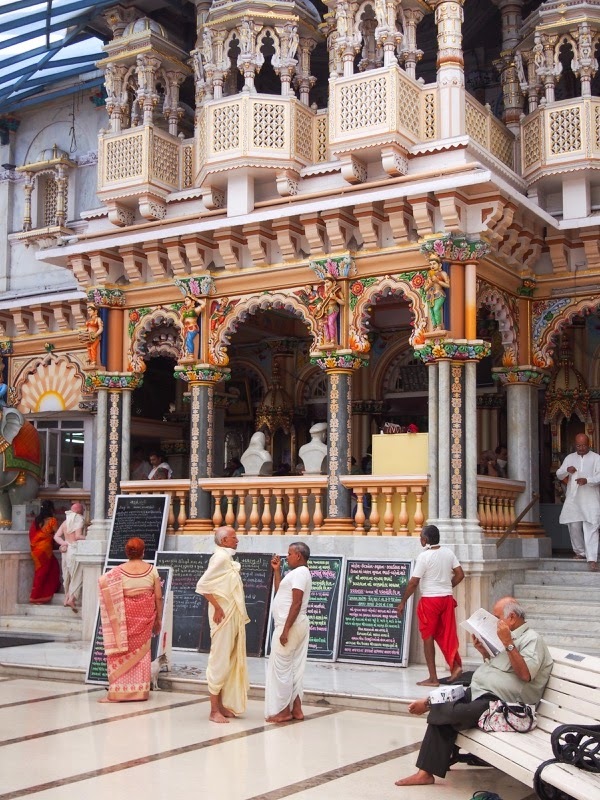 The Jains are a religious minority whose beliefs are fairly extremist- but in a friendly way. 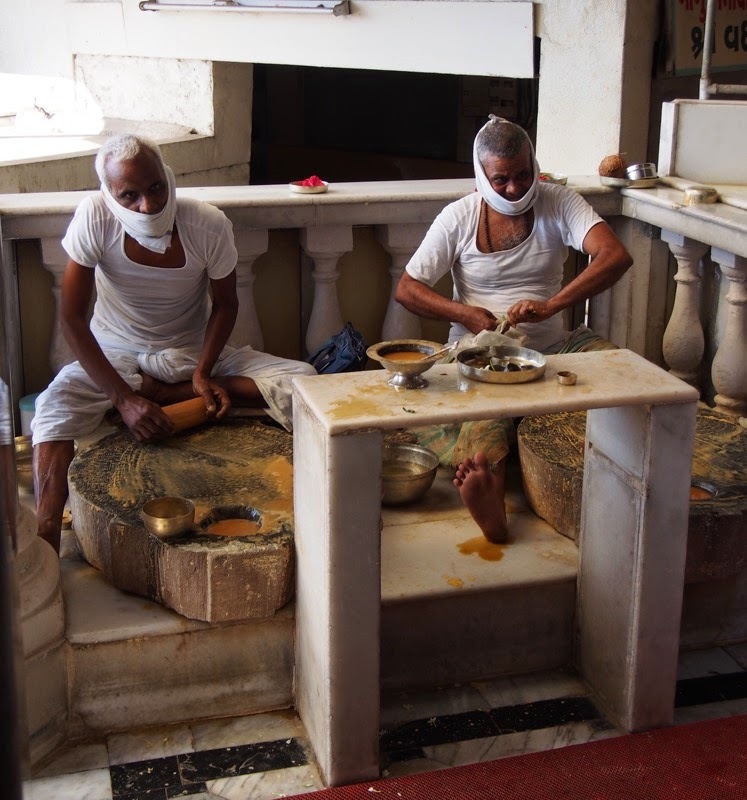 Fanatically non-violent, Jain priests cover their mouths to prevent little insects from flying in, and they've banished root vegetables from their diet, lest any small critters get disturbed when they are pulled from the ground. Meat is completely off limits of course. The Walkeshwar Jain temple is a reflection of the great Jain temples of Ranakpur, with lots of carved white marble. Surprisingly, a touch of colour has been added here. It's busy in the mornings when devout Jains come to pray and make offers. Babulnath temple is well hidden- all you see from the road is an impressive entrance gate, which I've passed a gazillion times on the way from South Bombay to the Western Suburbs, without ever stopping to see what's behind it. Don't make the same mistake: go through the gate, pick up some flowers (or milk) from the vendors and slowly make your way up along a long, windy staircase past Victorian tenements and a holy peepul tree. 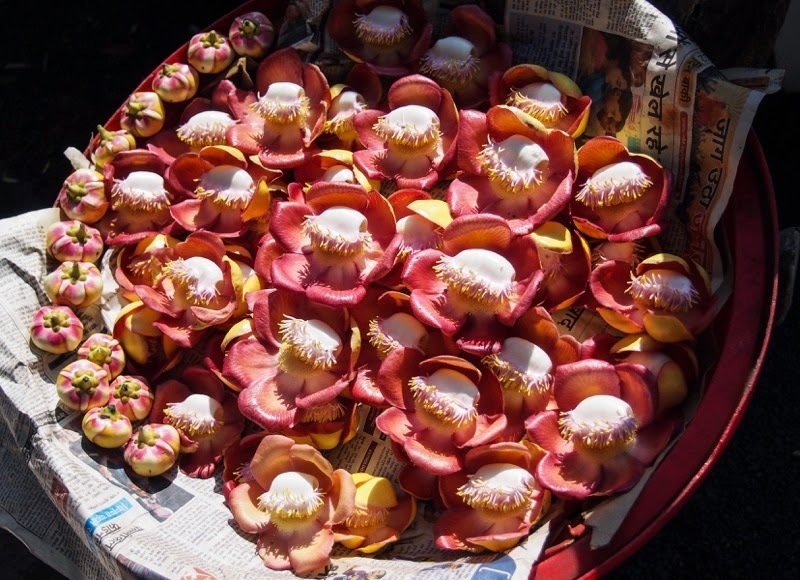 These yoni-like flowers seem like an appropriate offer for Shiva's lingam. 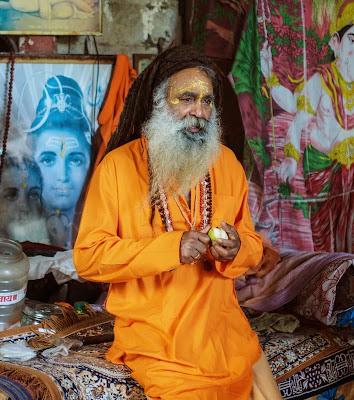 You will pass through a grotto-like passageway, home to the temple's resident Sadhu (holy man), before you finally get to the actual shrine, on top of the hill. The Sadhu eats an apple- Lord Shiva keeps a watchful eye. It can be quite busy here- this is a Shiva temple and a steady stream of worshippers comes to pour liquid over the massive lingam in the main shrine. Most priests wear white, but this one must be particularly confident in his male sexuality. 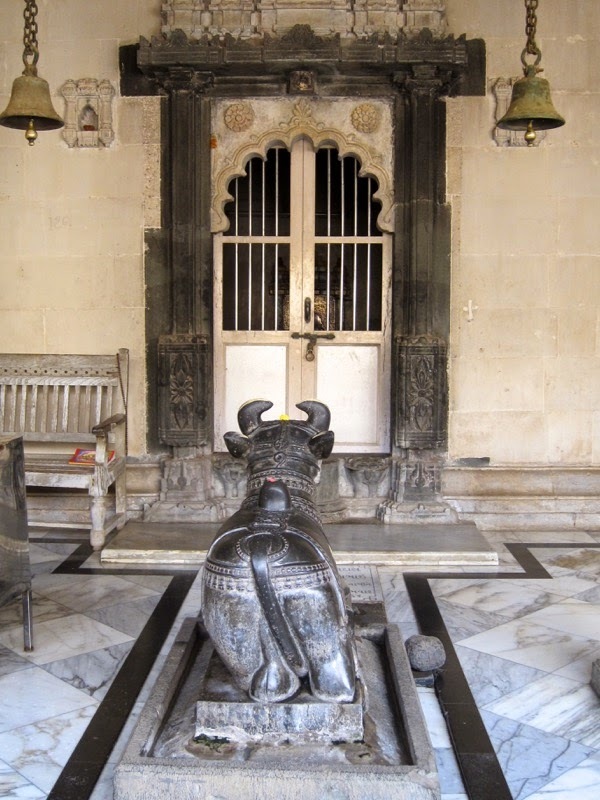 The current structure dates back to 1890 but worshippers have been rubbing their lingams here since the 12th century, making it one of the oldest places of worship in Bombay. I love the Hare Krishnas. 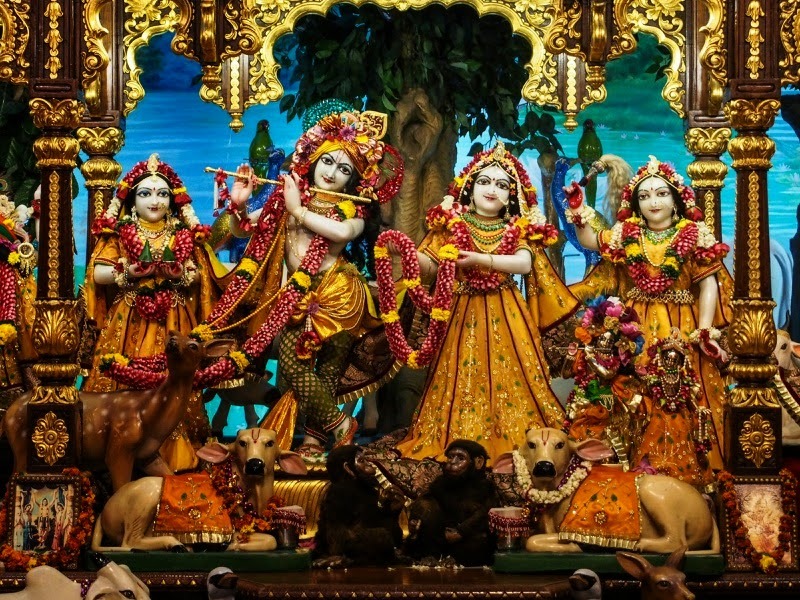 They're a genuinely friendly and happy bunch, always happy to welcome visitors and talk about Lord Krishna, cosmic love, and the attractions of their on-site all-veg restaurant (highly recommended!). Hare Krishna, Hare Krishna, Krishna Krishna, Hare Hare. The main ISKCON (International Society of Krishna Consciousness, aka the Hare Krishas) temple is all the way up north in Juhu (and has an even bigger restaurant), but this branch in Girgaon is pretty cool too. There's the great collection of technicolour Krishna statues and lots of garland-making. Oh, did I mention the restaurant? 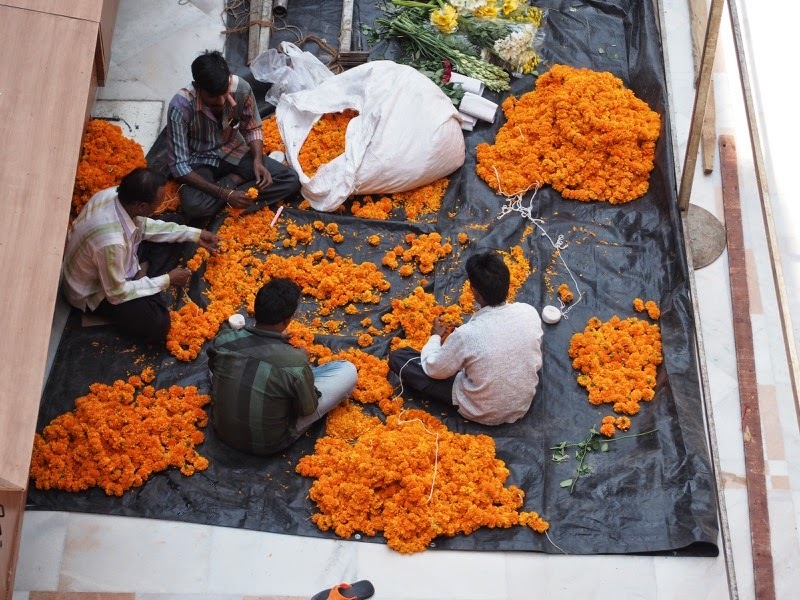 Need marigolds? Lord Krishna's got you covered with industrial quantities of hand-made garlands. 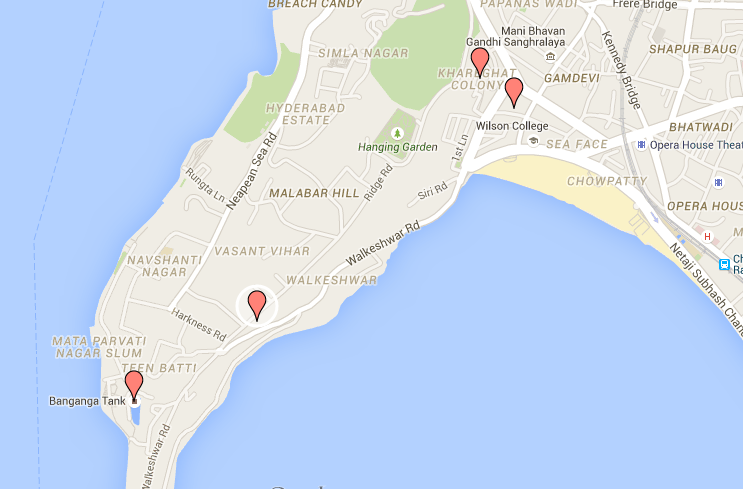 Start by taking a taxi to Banganga tank, and work your way north from there. 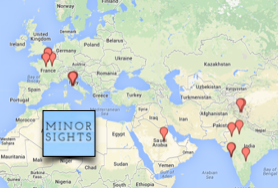 The Minor Sights on a Map page lists all four temples. The nearest train station is Charni Rd but it's still quite a sweaty and uncomfortable hike from there to Banganga. All the temples welcome visitors: follow any signposted rules, dress respectfully (no shorts, tank tops etc.) and leave your shoes at the entrance. For a few rupees the shoe lady at Babulnath will guard your Birkenstocks.